Summary: Within this foundational piece, Britton describes examples of K-university classroom practice (including the work of some NWP teachers), as well as theory and research supporting learning environments where reading, writing, and talk become catalysts for collaboration and learning. The depth and breadth of this chapter might lead to some intriguing opportunities for study groups to draw parallels and contrasts between 1987 and today; to historically and theoretically situate practices such as dialogue journals, free-writing/free-reading, collaborative learning, and real world learning; and to explore Britton’s suggestions for teachers and administrators. And so, for Nancie Atwell, the reading program in her classroom “became much more than a program, more a way of life”— or rather part of the way of life already established through writing. Drawing inspiration from the Dialogue Journals described by Jana Staton, she initiated a letter exchange with the students about their reading. 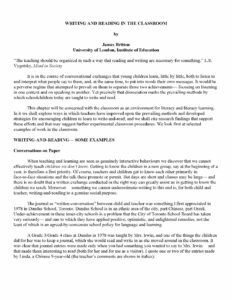 Gradually over time, she began to harvest comments on the reading that clearly reflected the students’ experiences as writers. And at the same time stories, fictional and autobiographical, began to find a place in what the students wrote. Atwell documents the progress of two students throughout Grade 8: they offer us convincing evidence of the way they learned to write-and-read and the important role that literature played in that process. It has been claimed—rightly, we believe—that the experience of reading a work of fiction will tend to have the effect on a reader of making real life more “observable.” The “pattern-forming” activity involved in responding to a work of fiction is sustained, perhaps, as a reader returns to contemplating his own situation. Similarly, a child who has been moved by a poem may well have taken up a kind of stance from which to write his own poem. This is very different, I think, from direct imitation or “modeling”; it is probably a transaction at a deeper level—the effect of an effect—one particular way in which writing and reading may be interrelated in the classroom.